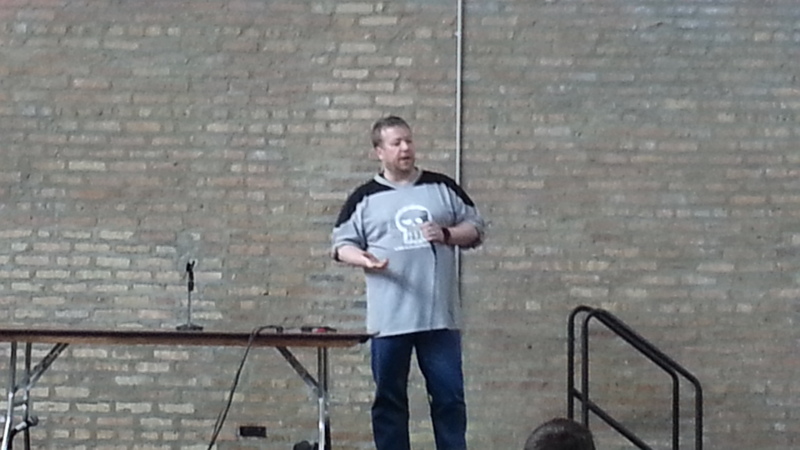 I just returned from a brief trip to Chicago, where I attended and presented at Thotcon, as well as attended BSides Chicago. Thursday: After a two hour delay due to “mechanical” issues, I arrived in Chicago. I am a bit surprised, as the flight crew in Denver did not give us a lot of confidence. We were told a “switch” needed to be replaced and it wasn’t switching or something. This led to them telling us that they would have to “rewind” the engine, which doesn’t seem logical. From the airport, a long and slow taxi ride made me late for the THOTCON speaker dinner at the Northdown Cafe and Taproom. This is where I found the ‘Curmudgeon’ beer pictured below. 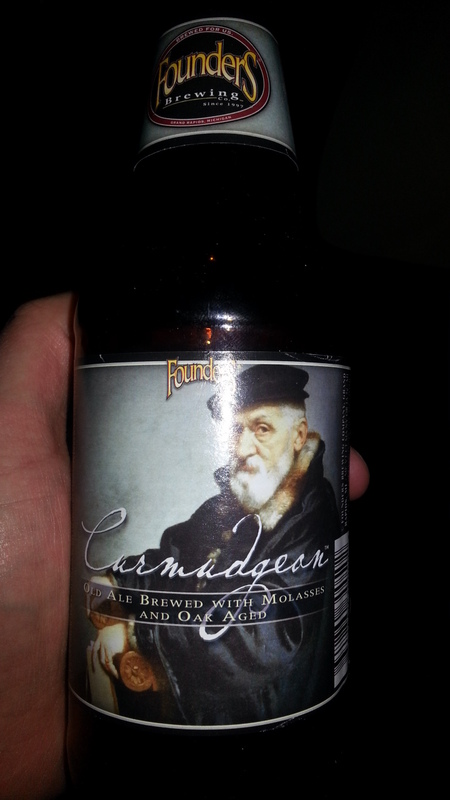 There is something very satisfying about ordering a ‘curmudgeon’ at a bar and getting a bottle. 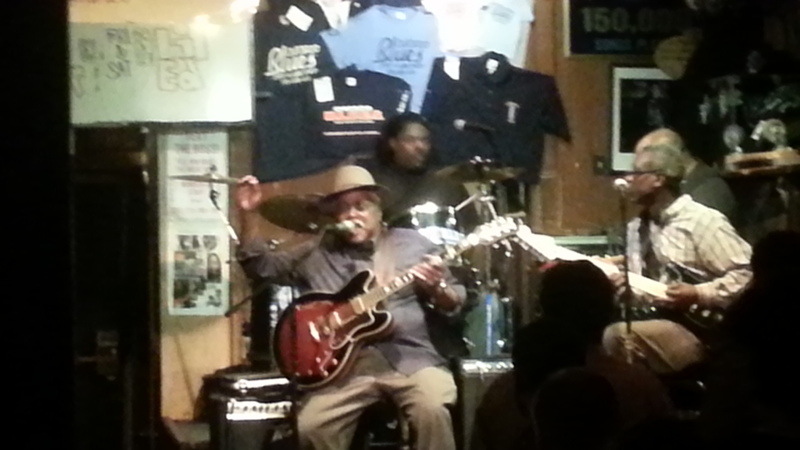 After the dinner, Space Rogue, Josh Corman, Banshee, and I went out looking for some good Blues music. 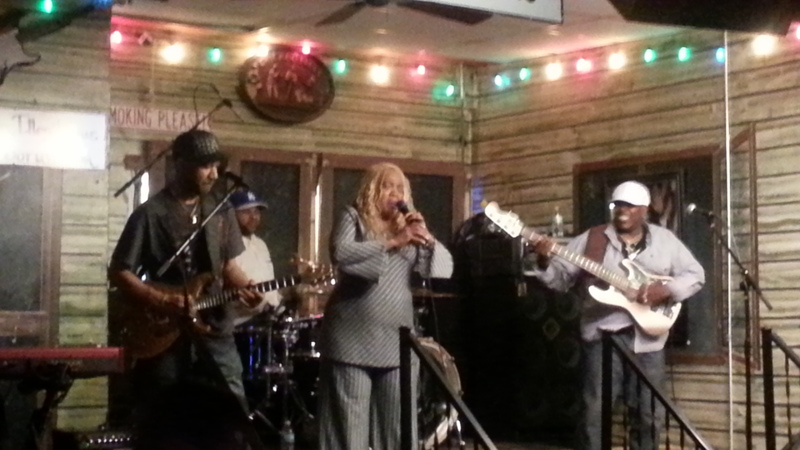 We started at Kingston Mines but found the music to be too upbeat. Across the road at B.L.U.E.S. we found exactly what we were looking at. I had told my companions that I wanted a guy sitting on stage singing and playing the guitar, and it delivered. The $1.50 Jägermeister shots appealed to Space Rogue greatly. 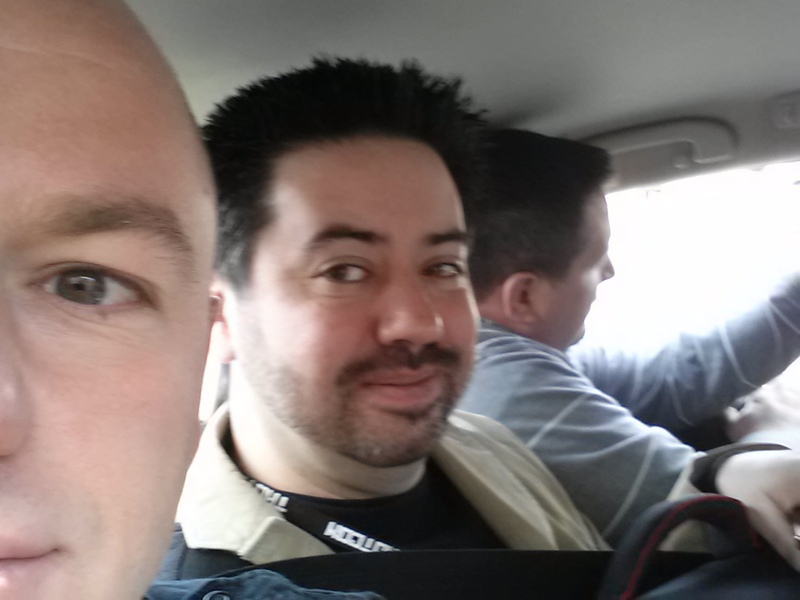 Friday: As happened a few times, the day began with or included a packed cab ride. The immediate surprise was the venue. The Ravenswood Event Center sounds like any other hall for a convention, but in reality is a unique space. 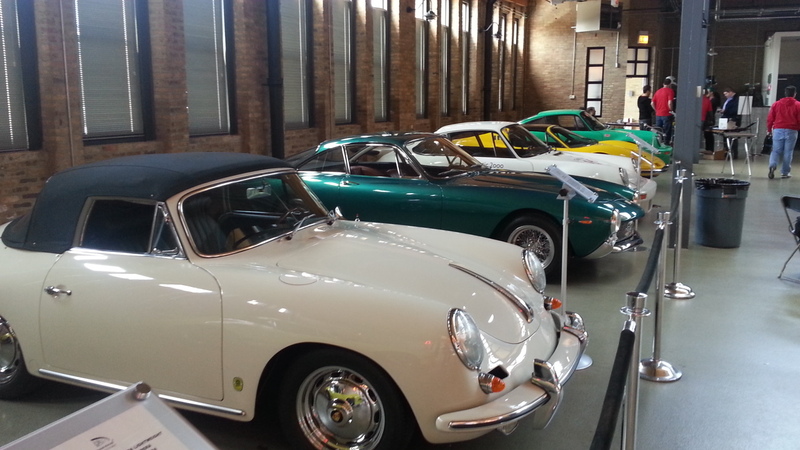 Around the main conference room were a variety of old sports cars in immaculate condition. The third floor space reserved for speakers had high glass walls for a bright room with good views. Courtesy of THOTCON staff, the speakers could use this as a lounge for talk preparation, free booze, and a hosted lunch. 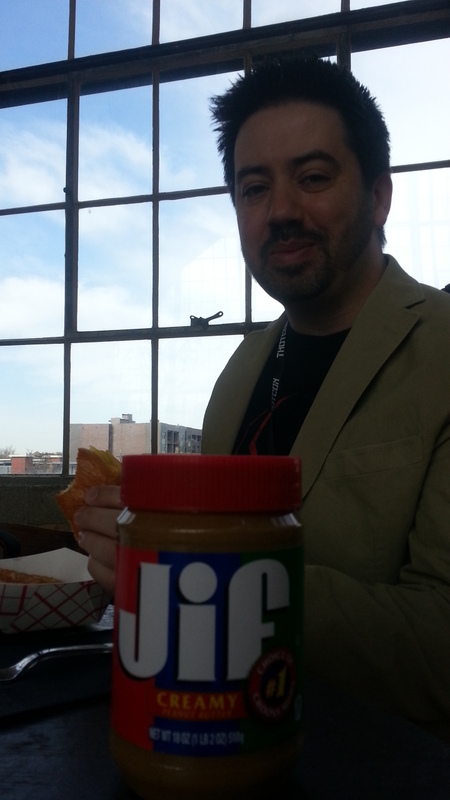 I ran into Jeff Jarmoc again who delivered on his promise to bring us a jar of peanut butter for a stage prop. The picture of the Jif alongside the THOTCON wireless information was proof for Advanced Threat who doubted my presence in Chicago. 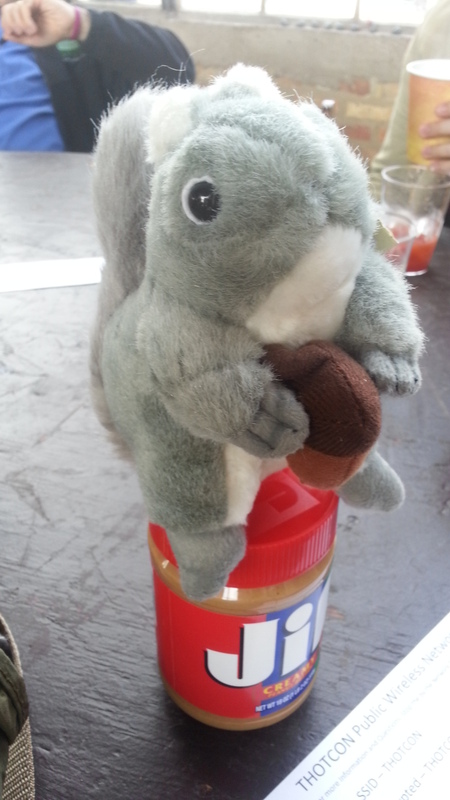 Not to be outdone by Jarmoc, Banshee produced a stuffed squirrel who could enjoy the jar. The first keynote of the day was by Bruce Schneier, who treated the audience like a bunch of eight-year olds, going into the very basics of social contract by stretching it out 30 minutes via the speaking method of “repeat yourself using different words seventeen times”. Josh and I were both groaning throughout his presentation and I opted to take a ‘meta’ picture by photographing the event photographer. Of course, any InfoSec conference needs drama, and THOTCON’s was in the form of someone complaining about the “race card” that was being passed around. 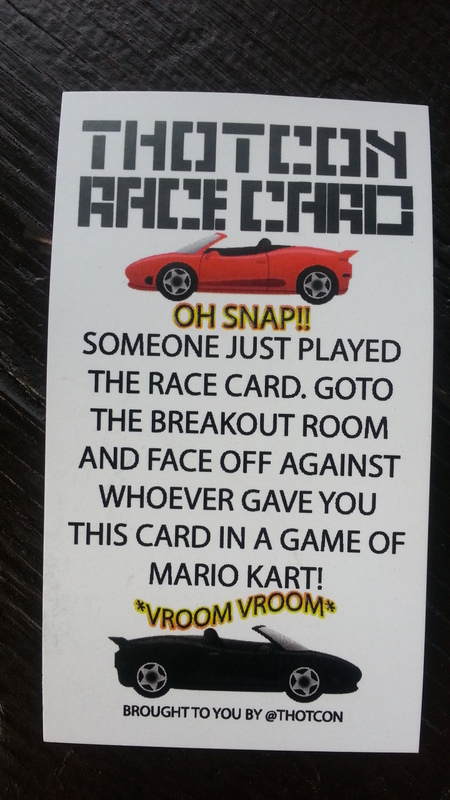 Of course, it had absolutely nothing to do with race, and everything to do with Mario Kart racing, but that didn’t matter. I thought the cards were hilarious. The other sticker that came with registration was potentially a trigger, but everyone seemed to love it as well as the shirts that said “Fork My Dongle“. Shortly before my talk, I jumped over to Track 2 to see James Arlen present on how to do a better presentation. His very brief talk was a boiled down version of a much longer workshop he gives, and it should be required viewing by anyone presenting, especially in InfoSec. 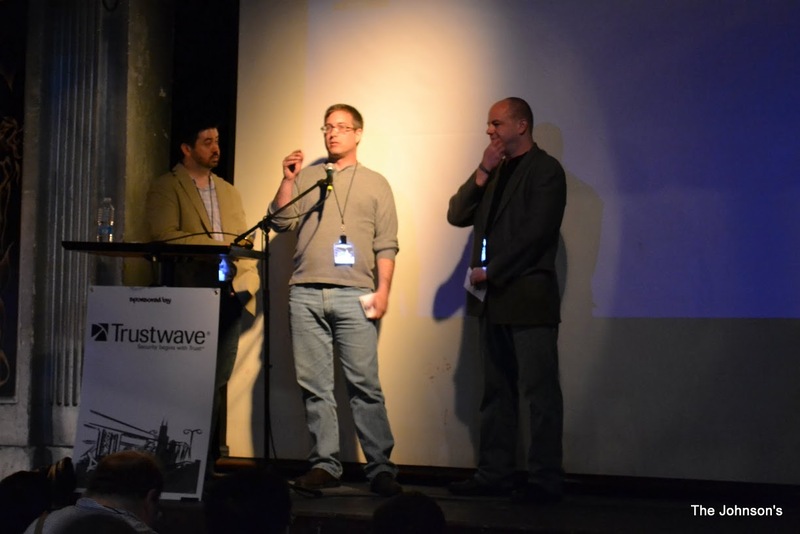 At 3:00PM, Josh Corman and I took the stage to give our “Cyberwar: Not what we were expecting” talk. With some new slides and updated material, I ran a bit longer than I should have causing Josh to hurry through the last bit. We really should have boiled it down a bit, or bribed someone for a 90 minute speaking slot. Part of the delay though, is fully on Corman’s shoulders. 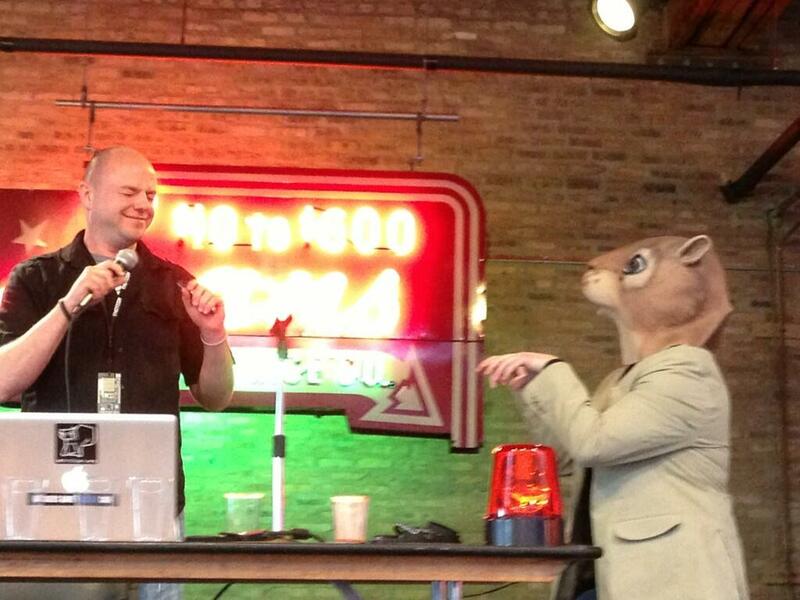 While I was talking, he quickly put on a squirrel mask and hopped across the stage at me. No, this was not staged. The main reason it “blue screened” me as Josh put it, is that I own one of these masks. I certainly wasn’t expecting to see it hopping across the stage at me mid-presentation. Well played Corman. For dinner, we headed out looking for whatever was good and close to the venue thinking we’d return quickly for the closing bits. 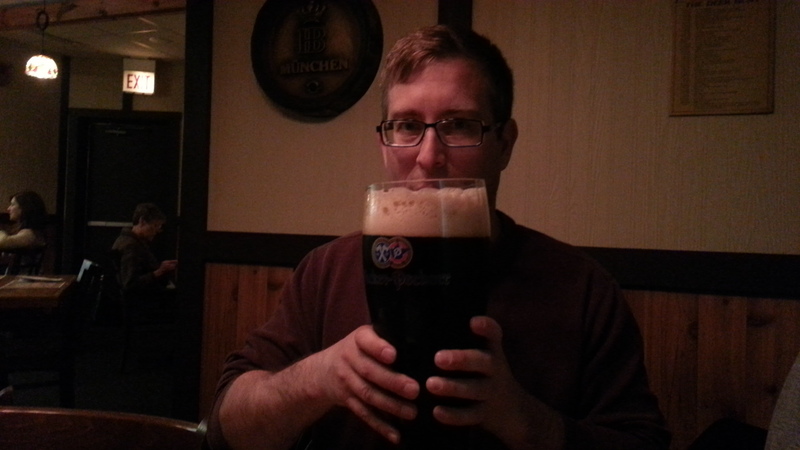 Instead, we were lured into a long and hilarious German dinner at Laschet’s Inn. Our waitress JoJo, an “Irish-German-Texan” with a healthy southern drawl was hilarious and energetic. The group we ended up dining with, all coworkers at the National Association of Realtors®, were great hosts. 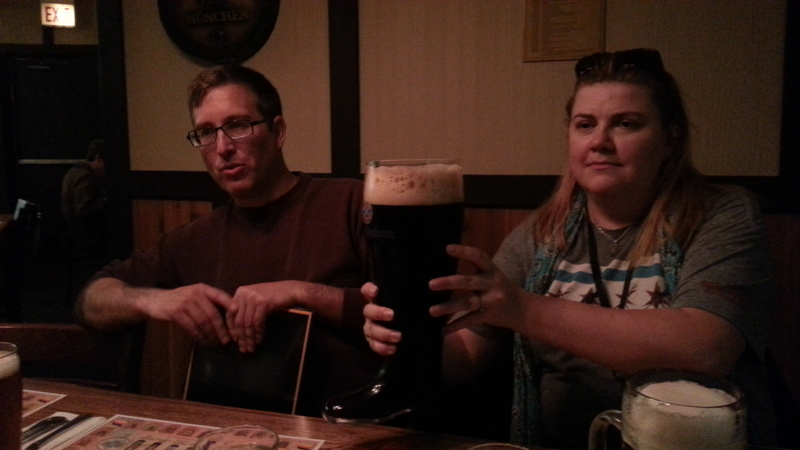 They got the ‘boots’ of beer started immediately, before waves of appetizers and outstanding authentic German food. In the end, they graciously took care of the tab as well, completely shattering the image of Chicago being full of gun-toting thugs. As usual, a three hour meal about security, food, and everything between was as educational as it was fun. Saturday: We began the day at a ‘Recovery Breakfast’ organized by SecBarbie, at the Little Goat Cafe. From here most of us used the Zack Fasel cab service to get to the Abbey Pub for BSides Chicago. I had reservations going into this, as a ‘pub’ sounds like a small cramped venue for a bigger BSides conference. Upon arrival, I quickly noted how it was a perfect venue. Several rooms segregated to avoid noise issues, an upstairs overlooking the main speaking room for the CTF setup, and two bars to deliver libations all day long. Shortly after arriving, Space Rogue, Josh Corman, and I offered to do an impromptu ‘talk’ (a research project really) to gauge how alternate sources of information such as Twitter, IRC, or vendor press releases were picked up by more mainstream media. I will be writing a blog on the conclusion of that in a few days, stay tuned. After a great day at BSides, Josh and I headed to L2O Restaurant for an epic dinner. Sunday: After a leisurely morning and sleeping in, William Knowles took me to Lou Malnati’s for some authentic deep dish pizza, before a ride to the airport. Fortunately there were no delays due to sequester or switchy thingies this time. While I am not a fan of travel, this ended up being a great trip with good friends, new and old. 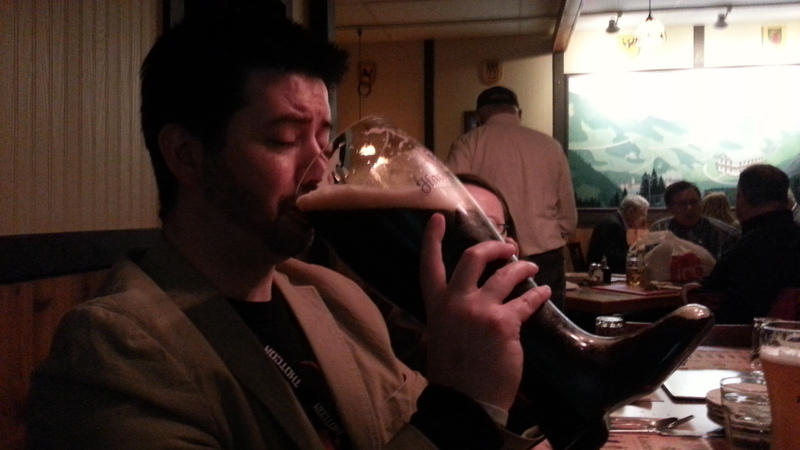 THOTCON’s reputation for being a great con is well deserved, and the organizers are great. 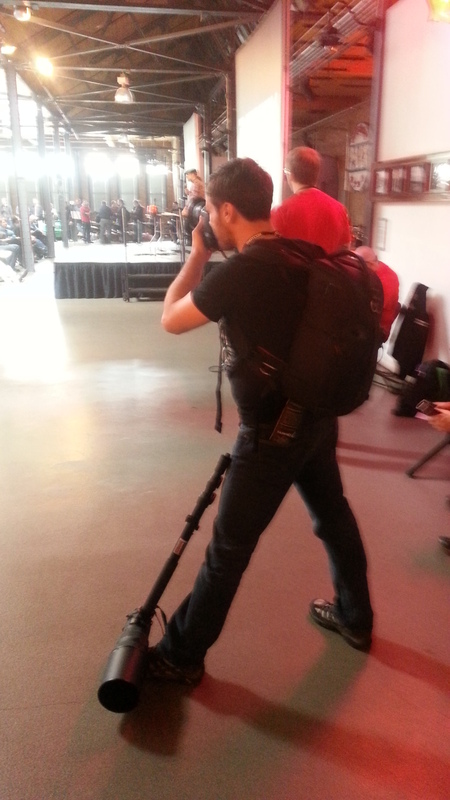 A special thanks to Nicholas Percoco for the outstanding hospitality given to THOTCON speakers. It was our pleasure to have you guys with us at Laschet’s. Hopefully we weren’t too obnoxious. It was fun and it was good to shoot the breeze.